In Pursuit of My Own Library: Would you be a Gaffer? Good afternoon, and as promised, Happy Release Day to Charlie Holmberg. Excellent follow up to The Paper Magician. I really have been impressed with this series so far, and I am very excited for the next installment. This time we experience the exploits of Ceony and her friend Delilah, a burgeoning glass magician, aka Gaffer. To not be horrifically spoiler crushing to The Paper Magician, I will only state that we are now in hot pursuit of the Excisioners yet again. Ceony has taken on crime fighting despite her apprentice status because she was able to complete finishing school in a record year. Clearly she is enthusiastic about her abilities. If only they could hold a candle to the actual magicians. Chaos and tragedy ensue. We are able to learn a completely different side of the magic system in this second novel and it is even more enchanting than in the first novel. 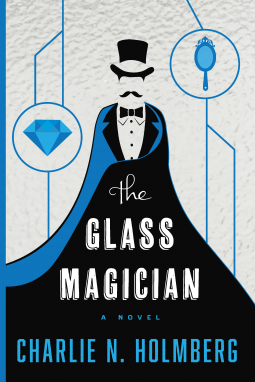 Not only does Mrs. Holmberg delve into the creative ingenuity of glass magic, but she presents us with the mystery of the Bonding magic. The originality is still strong in this story. The story line moved a little awkwardly for me this time around. There were moments that rushed by and I felt like it was pushed a little too much. Some of the writing felt a touch forced. The plot was still fabulous and I finished the whole novel in 18 hours. This novel also deserves 5 stars. It has a strong re-read capability which makes it worthy of joining my shelves.